S T Y L I S H . M: Should I Buy A Louis Vuitton Speedy? I need your help people! I find myself in a little bit of a predicament and would like your opinion. 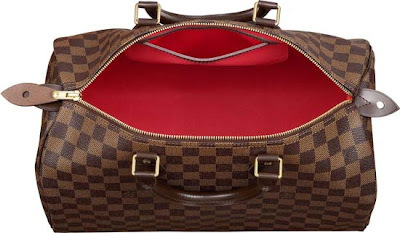 I have wanted a Louis Vuitton Speedy 35 in the damier print for quite a while now and decided I would finally purchase one for my birthday, which is coming up. The bag itself is not leather apart from the handles and trimmings. All of the reviews I have read about this bag are positive with the only downside being the fact you have to wear it on your elbow or carry it. 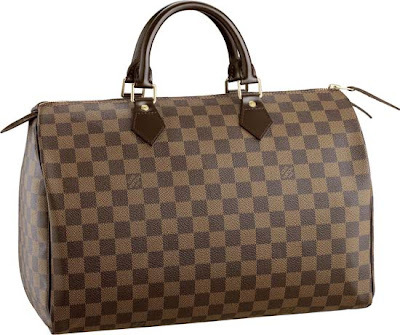 Louis Vuitton bags are definitely a good investment with their good quality and they are very long lasting. It wouldn't be spending unwisely if you truly make use of the bag. £455 for one bag that isn't even that nice? :P Seems to be that's a big waste. Whether or not it's long lasting. I'm sure you could get an equally amazing bag for much less. Mmm, this is better than expected :) 75% of the answers so far are perfect lol. It's alright, but in truth, I see them all over the city so it does seem a bit conformist. I'd be okay with spending that much if I donated 2-20% of that price to charity within the month. assalaamu aleykum sis!I think You should purchase it as a birthday gift for yourself,especially if your working hard to pay for it. Yukirat: Wow, great minds think alike lol! That's what I had been planning to do!!!!! I think you've already decided.. I don't particulary love it, esp since it can't be carried on your shoulder which is completely impractical. I always wanted one too! Then the brand become this huge fad, and almost everyone has a similar bag, then it lost all its appeal to me. If you really want one you should get it. i think you should get yourself the bag. its your birthday and i am sure you deserve it! treat yourself especially if you have been a great muslimah all year. which i am sure you have. Yeh, I get the leather thing and having to carry it on your elbow but, I dunno, I just want it!! Insha'Allah, you'll make the right decision. Imran: Lool. I prefer to call it £455.. I know it's a lot but they are excellent quality bags, surely that counts for something..? wooooow, girls got expensive tastes!! :) masAllah! i dont think its super cute but i am not stylish either, so thats probably a good sign lmao! I think if you get it, it will be like showing pride and besides Allah has said we should not have too much attachment to worldly things...and besides there is nothing like birthdays in islam..
Shalela: I don't see how owning this bag equates to pride. Well, everybody has a day of birth and I don't really see the problem in acknowledging that you are another year older. it is much better to say that i know birthday celebrations are not allowed in islam...but i like to celebrate it and may allah forgive me....that'll be correct!! PS: Sorry if i gave a lecture..just thought its righteous! P.S. I haven't told anyone to celebrate anything. Hello, I saw your blog here in Brazil! It´s so wonderful to know other culture and how they dressed. Sister, if you want it, just get it. my last comment and view for your blog..
No Way 730$ for a bag is outrageous! If you can afford it, it's not a waste of money. everyone has an idea of what's "wasteful" but they usually consider it wasteful according to THEIR means, not yours! So yeah I love LV bags, i actually plan to get a speedy 35 as well but in the traditional print! Any who I think it's worth the investment, i know a woman whose mom got the LV bag when she was my age (21) and now she is well in her 50's and still has the SAME bag and it's in mint condition! And who cares who thinks it's nice or not? if you like it thats all that matters! So did you get it/ Are you getting it? Candice: I got it today!!! I loove it :))) I took ages to decide in the shop whether to get it or not but after much deliberation, I decided I might as well as I have wanted it for ages. I think that.. If you pay zatak and do charitable .. So Allahu yalam..
Ahh... Or you can pray 2 raka2 and ask for Allah about the bag. What do you think?? after you tell us if you purchased or not ok?!! Mariam: That's a good idea, but I have already bought it lol :D I love it! Why not buy a cheaper bag and donate the rest of the money to some poor muslim family. Get real , you know you want the bag just because its LV, not for the "quality". Its funny people on this blog will have debates about whether listening to music is "forbidden by god" ..yet turn around and post about buying lavish non-essentials. Wonder what your prophet muhammad would have to say on this purchase haha. Anonymous: You sound like a non Muslim so I'm not going to get into a religious debate with you. But I will say, so what if I want to buy it because it's lv? Islam does not forbid the spending of ones wealth, as long as they spend within their capabilities. I work hard for any money that I get and I do not see the wrong in treating myself now and again. Perhaps you should remove yourself from your high horse and analyse your own contentious personality. I'm Rabia from Saudi Arabia. I'm a new Muslim and I love LV bags, eventhough I don't have one (yet). I go to Madrasah and our teacher, wears a lovely LV Trevi bag and it's a lot more expensive than a speedy. She comes and goes in a posh BMW. Does it make her a bad Muslimah? I don't think so, she helps a lot of Muslimahs and may Allah bless her and reward her efforts in Jannah Insha'Allah. If you have peace and your niyat is pure, and you don't intentionally disobey Allah's commandments and the Prophet's (pbuh) teachings, then I say it's halal. I may be new in Islam but I know that Allah knows our hearts and He is the One who knows best. I am ready to buy this bag too! But I can't decide between this and a Burberry. LV is so popular so I think I will get the LV. You should get one too. Sometimes you have to please yourself too and Allah will not punish you for that. He put you on this Earth for you to be happy. And if you're happiness includes this purse, which you will pay for with your money you worked for, than I say go for it! I'm late to this conversation but I would suggest buying off ebay with a cc. You can find one gently used for a fraction of the cost. Just make sure you have buyer protection. Just FYI. salaamalaikum,i love LV bags.im planning on buying an alma amarante!!! !it is expensive but i have been wanting to buy it for the past 3 yrs!